PDB-101: Global Health: Diabetes Mellitus: About: What is Diabetes? Diabetes Mellitus (DM) is a group of chronic progressive metabolic diseases with increasing worldwide prevalence. It is commonly characterized by hyperglycemia - meaning high levels of glucose in the blood. The primary cause of diabetes is the absence of a hormone called insulin (Figure 1) and/or the inability of muscle and fat cells in the body to respond to this hormone and use glucose. Learn more about insulin. The term “Diabetes Mellitus” is derived from two words - (a) the Greek word “diabetes” meaning “siphon”, referring to the increased urination seen in this disease; and (b) the Latin word “mellitus” meaning “honey or sweet”, referring to the sweet taste of the urine caused by spilling out of excess sugar in the urine. Interestingly, there are two distinct disorders that share the first name “diabetes” - diabetes mellitus and diabetes insipidus. Both conditions are associated with excessive urine output and constant thirst. However, the hallmark of diabetes insipidus is the inability of the kidneys to conserve water, resulting in excretion of large quantities of dilute urine. It is important to note that individuals diagnosed with diabetes insipidus do not exhibit abnormal blood glucose levels. Figure 1: Structure of human insulin showing its hexameric assembly (PDB ID: 1trz). 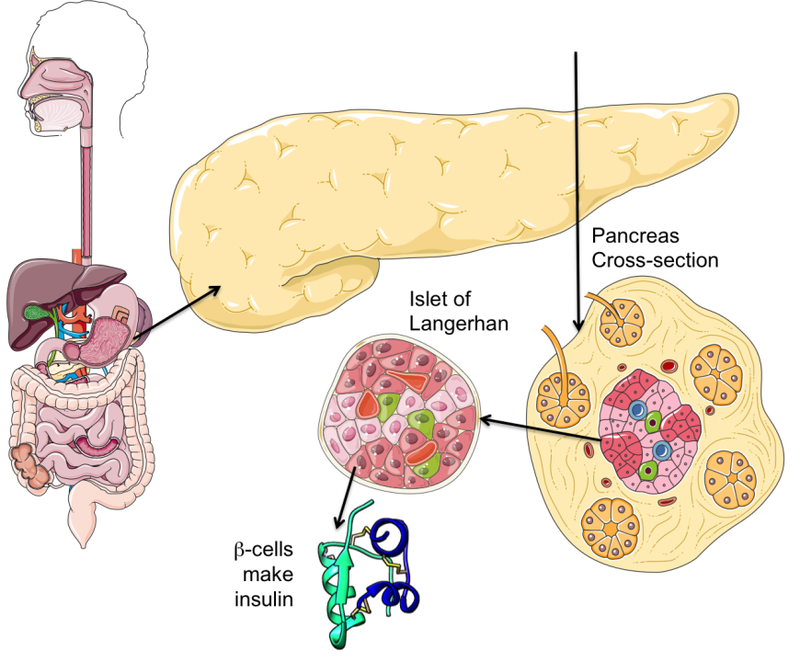 Insulin is a protein hormone, produced by specific cells in the pancreas called β-cell (pronounced beta cells, Figure 2). It is responsible for instructing cells in our body (primarily muscle and fat cells) to take in glucose from the blood and use it as a source of energy, store it for later use, or promote cell growth and proliferation. Without insulin, these cells are unable to use glucose and starve - i.e., the blood glucose levels in the individual may be significantly high, yet an inadequate supply of glucose in muscle and fat cells (starvation) can trigger mobilization of glycogen and fat stores. Over time, excess sugar in the blood binds to proteins in blood cells and tissues lining blood vessels by a chemical process called glycation. On the other hand abnormal lipid profiles, due to unusual lipid metabolism, can lead to formation of plaques and thickening of blood vessel walls. Collectively, these processes lay the foundations for various complications of diabetes. Figure 2: Pancreas is an organ located behind the stomach. Insulin producing β-cells are located in the pancreatic islets of Langerhans. 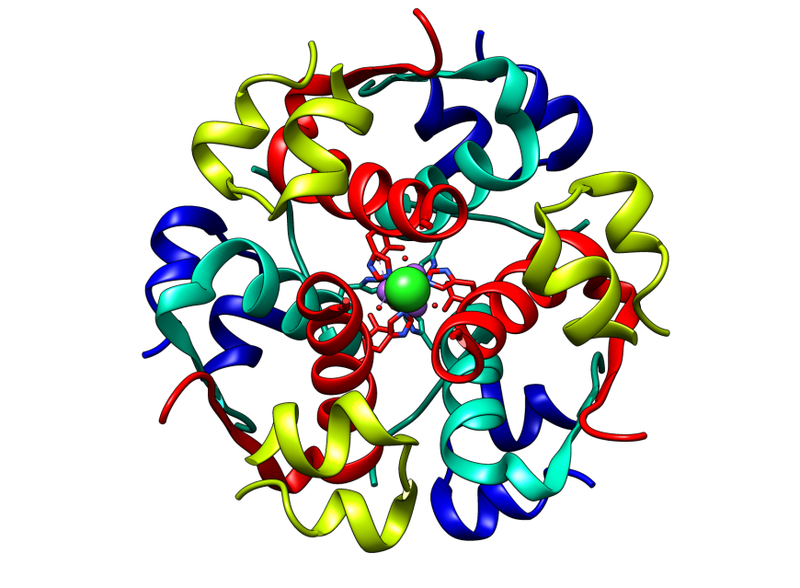 The insulin molecule is also shown as a ribbon diagram (PDB ID: 1trz). Portions of the figure were adapted from Servier Medical Art. The insulin molecule is made of 2 short protein chains (shown in green and blue in Figure 2). Note that these protein chains are held together by staple-like structures called disulfide bridges or bonds (shown in yellow). These linkages are formed between specific building blocks of the proteins - the amino acid cysteines. There are 2 inter-chain (between chain) and 1 intra-chain (within the chain) disulfide bonds in the insulin structure. The molecule shown here is called an insulin monomer, and is the form that binds to its receptor to carry out its function. Six such monomers come together to form Insulin hexamers - the storage form of insulin (not shown here). Learn more about insulin monomers and hexamers by making a paper model and exploring its structure and activity.